Total Course Fee is only BDT 15,000/- where members of BSHRM members will get 20% waiver on total fees. 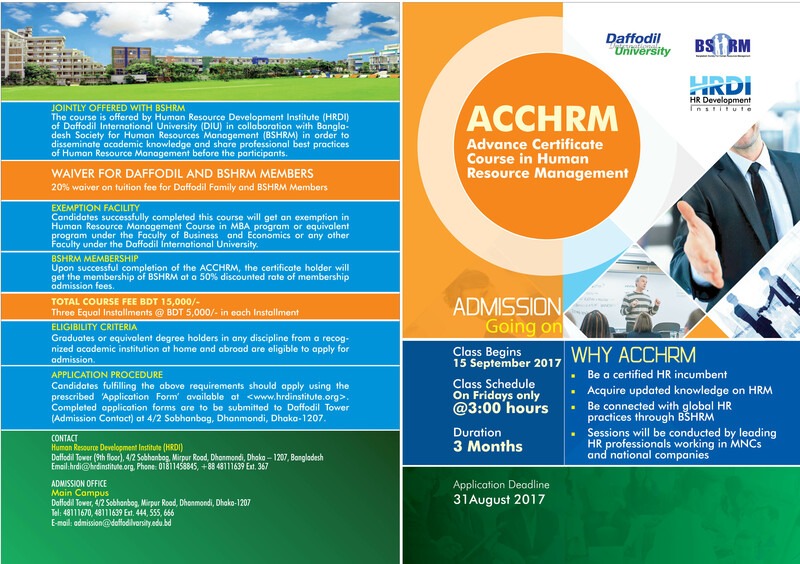 We have the pleasure to inform you that Bangladesh Society for Human Resources Management (BSHRM) in association with Human resource Development Institute (HRDI) is going to offer Advance Certificate Course in Human Resource Management (ACCHRM) from September 2017. BSHRM members, especially General Members and Student Members should take this opportunity. As decided, ACCHRM certificate holders can use this certificate for their membership up-gradation too at BSHRM. Admission is going on. Application Deadline: 31 August 2017. Class Begins: 15 September 2017. Classes will be held only on Fridays from 3:00 pm to 6:00 pm.